Crepes owe their feathery lightness to a finessed handling of the crepe pan and the lightness of their batter. Although thinner, crepe batter is as stable as pancake batter, and holds up just as well in storage. It's best to use crepe batter within 24 hours of storing it in the refrigerator and within 3 months of storing it in the freezer, although some sources may suggest a little longer. Store crepe batter in the refrigerator for 30 minutes after you mix it. 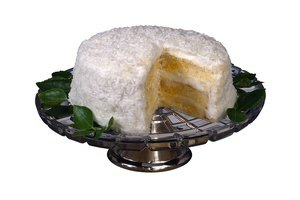 During this 30-minute resting period, the air bubbles that were created in the batter by mixing dissipate. The result is a smooth batter that cooks flat and uniform without random bubbles to upset the smooth plane of the crepe surface. Crepe batter lasts about 24 hours in the refrigerator. Pour the batter into an airtight storage container and store it at the rear of refrigerator, where it's coldest. 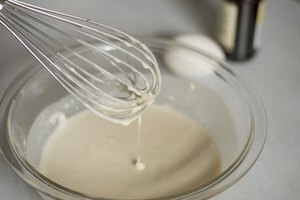 Before cooking, let the batter reach room temperature and whisk it enthusiastically to emulsify the ingredients. Fill a heavy-duty freezer bag three-fourths full with crepe batter. Press as much air from the bag as you can and seal it. Lay the freezer bag flat on a sheet pan or in a shallow dish and place it in the freezer for a few hours. Freezing the batter flat saves freezer space because it takes minimal space. Thaw the crepe batter overnight in the refrigerator or in a bowl of warm water a couple of hours before you want to cook the crepes. When the batter thaws, shake the bag vigorously to mix the ingredients. Cut a 1/3-inch corner from the freezer bag after you heat the crepe pan. To dispense the batter, simply hold it so the cut opening hovers about 2 inches above the center of the pan and squeeze.